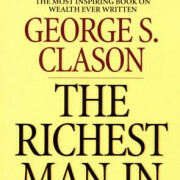 The Richest Man in Babylon is a book by George Samuel Clason which dispenses financial advice through a collection of parables set in ancient Babylon. Through their experiences in business and managing household finance, the characters in the parables learn simple lessons in financial wisdom. Originally a series of separate informational pamphlets distributed by banks and insurance companies, the pamphlets were bound together and published in book form in 1926. This book is one of those that you’ll discover has been read by more of the people you’ll see producing results, mentoring and influencing than you’d expect. It’s the simple idea that makes the big difference, and the simple ideas contained in these short stories are definitely useful. If’ you’re looking to expand your wealth and influence, this book needs to be on your reading list.